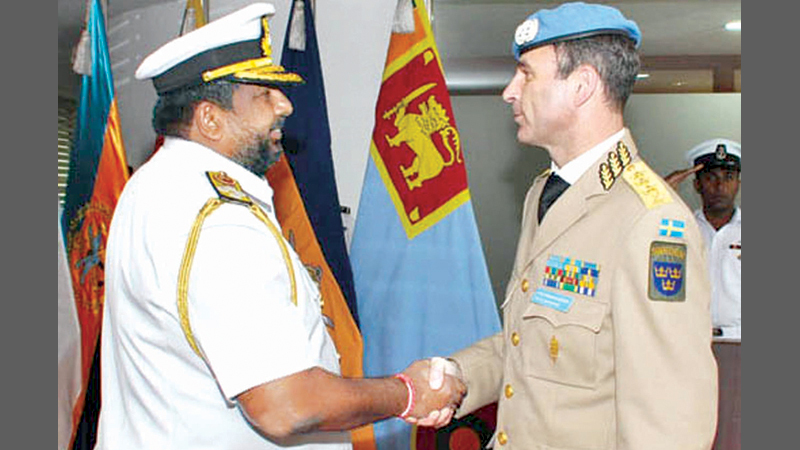 Chief of Defence Staff Admiral Ravindra Wijegunaratne with Lieutenant General Dr. Dennis T. Gyllensporre. The Force Commander of United Nations Multidimensional Integrated Stabilization Mission in Mali, Lieutenant General Dr. Dennis T. Gyllensporre paid a courtesy call on the Chief of Defence Staff Admiral Ravindra Wijegunaratne on Tuesday at his office at the BMICH. Lieutenant General Dr. Gyllensporre accompanied the coffins carrying remains of Major H.W.D. Jayawickrama and Sergeant S.S. Wijekumara who made the supreme sacrifice while serving in the UN Peacekeeping Mission in Mali. During the discussion, Lieutenant General Dr. Gyllensporre conveyed his condolences to the families of Major Jayawickrama and Sergeant Wijekumara, to the Sri Lankan military forces and also to the Sri Lankan government. He said the Sri Lankan military personal in Mali are well disciplined and professional and their performance is outstanding.